Access Profiles, Inc.: Our Happy Clients! The absolute best thing for any business is to have happy and loyal clients ~ and we are very proud to to have forged this kind of relationship with our own! The following is from one of our oldest clients. They signed on with API shortly after Kim became sole owner, and have been with us ever since! "I am writing to recommend the services of Kimberly Kline and Access Profiles. I have been using her services for the past 12 years, and have always been completely satisfied. She does an excellent job and (is) always very timely with her background checks. Kim will always go above and beyond in her research in order to help our hiring process for our customers. ", Jay B., Contract Administrator. 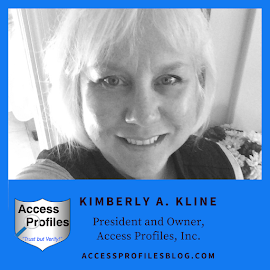 "It is my pleasure to give my personal and professional endorsement to Kimberly Kline of Access Profiles, Inc. I have found (API's) services, expertise, and professionalism, to be top notch.....She has been thorough and expeditious at all times, including those times when we've had requirements for immediate service. (API) is a very valuable business partner to me, and I know that I can count on (them) at any time. (Their) contributions to our company's employment verification process are significant. I would recommend Kim and Access Profiles, Inc. without hesitation, and have done so when the opportunity presented itself", Linda C., H.R. and Financial Administrator. "The process of working with (API) is streamlined. All requests are processed in a timely fashion. (API) is able and willing to process rush requests. Any issues that arise are communicated to me at the earliest opportunity. Results are presented in an easy to read format. Not only does Kim process highly-confidential background checks regarding regulatory compliance cases, she is also available to answer questions I have about specific requests. I appreciate her candor and expertise. In today’s day and age, with all the rules and regulations governing background checks, Kim is “in the know” as to requirements and guidelines for all searches. 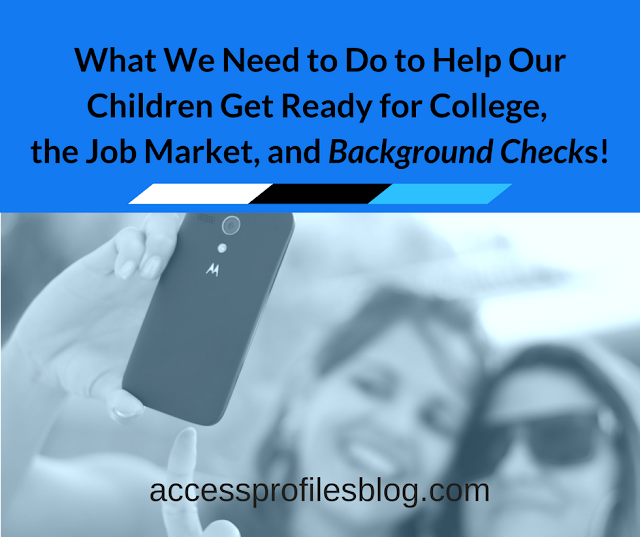 When it comes to employment background checks, Kim acts as a guide through the process which helps to protect both employer AND prospective employee", Kathryn L., PCI. "I am writing this letter today to express my thanks for all Kimberly Kline and Access Profiles has done for (our company). We are required by the PUC to do background checks on all our employees and there are times when these need processed same day due to our hiring needs....We have been using Kim since 1996 and over the years, she has become our only source of these background checks. The reason is quite simple. She comes through for (us) without fail. I have started to refer our colleagues to Kim because of this. I highly recommend Kim and Access Profiles, Inc. as she consistently exceeds our expectations", Jim M., General Manager. The following reviews are from two of our newest clients. "I was impressed with Kim’s Access Profiles, Inc. (API) informative postings on LinkedIn. I then subscribed to the weekly blog. I am now a regular reader of her HR, Job Search and Mentoring advice. As a small business consultant, I find the fact that she understands my interests from the same entrepreneurial /small business perspective reassuring. She knows what she’s talking about! I highly recommend Access Profiles, Inc. services to anyone. Kim and David are knowledgeable, reliable, and great to work with", Marigrace M., Principal Consultant. "(We) contracted with Kimberly Kline for a training program to execute professional background screenings. We researched online (for) a company that appeared committed and professional in the world of professional background screening. Her web site was informative and demonstrated education and many years of experience. We called her and requested training while informing her we were newly certified. We wanted her practical experience and global education. She was very supportive and sent information weekly, adapting to different time zones, changes and curriculum requests for training meetings. When the training portion was complete, we contracted with her engaging in a formal mentoring program that she had designed. She adapted it again to schedules and demands that changed due to business needs that (we) requested. Her mentoring program went from the day to day work to assisting in a marketing plan and she remains open to additional courses based on needs in this growing arena and (to us) as her client. Her client services, her flexibility, her experience and knowledge, and her quick availability has assisted (our company) to be successful. I look forward to partnering on projects with Kimberly and will continue learning from her in this arena", Tami F., owner. To find out what API can do for you and your business, Contact Us Now!